This is the third and final part of the three-part series titled “Toronto Maple Leafs’ 2011-2012 Season in Review.” In this edition we take a look at some of what surprised us and some of what let Leaf fans down over the course of the regular season, mostly in terms of players. To view all three parts of the series, click here. It goes without saying that the biggest surprise heading into the season was that rookie defenceman Jake Gardiner had made the Leafs’ roster out of training camp and the biggest surprise as the season ended was that Gardiner managed to hold down a spot in the lineup as much as he did. A 21-year-old who had just finished up his third season at the University of Wisconsin, Gardiner played in 10 games going plus-four for the Toronto Marlies in 2010-2011 after posting 41 points in as many games at the collegiate level. Still, there was not one person who really believed that Gardiner would make the team, except for maybe the defenceman himself. Not only did he make it through training camp, but he stuck and came through all season long. Gardiner’s level of calmness with the puck, his drive and his swift skating are just three traits that made him what he was this season. He showed that he can anchor a power play when given the chance, knows exactly when to join in on the rush and isn’t too shabby in his own end, either. No one is entirely sure what to say when it comes to James Reimer. He played outstandingly well in his rookie season and he single-handedly gave the Leafs and their fans reason to talk about the playoffs. But that all seemed to go down the drain this season, although many would blame it on the head injury he suffered in mid-October. Despite the serious nature of his injury, though, many people still thought that he would be able to come back and play at a high level. He may be a great competitor as some would suggest, but as we’ve seen in the past with other NHL’ers, it’s always difficult to return from an injury such as the one Reimer suffered. No matter how you view injuries, Reimer’s poor play when he returned was nothing short of surprising. Like with Reimer, Kulemin’s lack of success in 2011-2012 wasn’t as much of a disappointment as it was a surprise. After cashing in on his scoring opportunities 30 times the season before, Kulemin didn’t even manage a third of that total this season with just seven goals. As well, the 25-year-old saw his points total dip from 57 to 28, resulting in a diminished role at various points throughout the season. Before this season, Kulemin had raised his level of play and improved his statistics in each of his three seasons, going from 15 goals and 31 points to 16 goals and 36 points and, as everyone knows by now, 30 goals and 57 points in 2010-2011. His shot, size and drive were what made him a promising young winger for the Leafs and now he finds himself in the midst of trade rumours. Not much needs to be said about the roller coaster that was the Maple Leafs’ penalty kill this season. They began the year by not being able to stop the opposition from scoring on the power play and ended it in a different fashion. The Leafs even managed to go an entire month without allowing a power play goal against at one point, but that doesn’t matter now. With bottom-six guys such as David Steckel, Mike Brown, Matthew Lombardi and Philippe Dupuis and a defence corps that consisted of Dion Phaneuf and Luke Schenn, no one thought the Leafs would play so terribly a man down. The biggest thing about the Leafs’ penalty kill is this: if they had of been as solid when it came to killing penalties as they were in the winter all season long, would they still be playing hockey? Anyone who signs a two-year contract worth $9.5 million is sure to feel some pressure, but even more so when you sign such a contract with the Toronto Maple Leafs with the expectation of leading the team’s top offensive line. That’s exactly what the case was when Tim Connolly joined the Leafs in July of 2011, and he didn’t fulfill those expectations. It’s easy to see why people would expect big things from a player like Connolly. Despite injury troubles earlier in his career, he had managed to score at nearly a point-per-game pace. This, combined with the players he would skate along with, had many believing that he was the right guy for this team and that he could easily fill the rather large hole that the Leafs had experienced down the middle for quite some time. Rather than that, he eventually found himself playing bottom-six minutes and learned to accept a checking role. That’s not bad as long as he can continue to evolve in that role, but at a cap hit of $4.75 million, his lack of offensive production isn’t exactly acceptable. 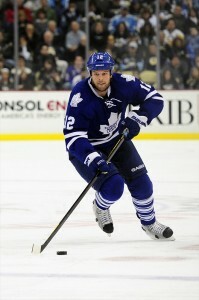 The way Phil Kessel ended the 2011-2012 season is actually difficult to categorize between surprising and disappointing. In one sense, it was surprising that he was able to score 37 goals without a true play maker to skate beside, but it was also disappointing given the fact that many people believed this was the season where he’d reach the 40-goal plateau. With a completely healthy Joffrey Lupul and a play maker in Tim Connolly both set to be on Kessel’s line, things looked promising. He got off to a great start with seven goals in his first five games, but it just wasn’t mean to be.